Chapel Market is a typical London street market, a stone's throw from the now very fashionable Angel, Islington. Twenty years ago it was the scene of regular violent clashes between fascists and anti-fascists, the outcome of which dictated the successful development of militant anti-fascist politics in the capital for the next decade. In the mid-70s members of the Socialist Workers Party and the National Front both held paper sales at Chapel Market, often resulting in clashes. At this time the NF was the biggest fascist party, winning 119,000 votes in the 1977 GLC elections and attracting thousands on to their demonstrations. Against this background hundreds of independent anti-fascist committees were set up around the country and the SWP launched the Anti Nazi League. Major confrontations against the NF at Wood Green and Lewisham in 1977 put militant anti-fascism in the national spotlight, and the SWP organised 'squads' in the ANL to carry out the physical side of the strategy. This lasted until Thatcher, playing the race card, won the 1979 general election which led to the NF's decline and the disbanding of the squads; the SWP argued that the Tories were now the 'real' enemy’. Physical opposition to the fascists was no longer acceptable. The Young NF paper Bulldog was now printing hit-lists of opponents and in early 1981 in Islington a radical community centre was firebombed and a left-wing bookshop attacked. Regardless of this, the ANL would provide no support for the anti-fascist activists trying to maintain their pitch and challenge the fascists. Support was provided though, from the remnants of the SWP squads who refused to disband and independent anti-fascists who saw the dangers of letting the fascists organise unopposed. 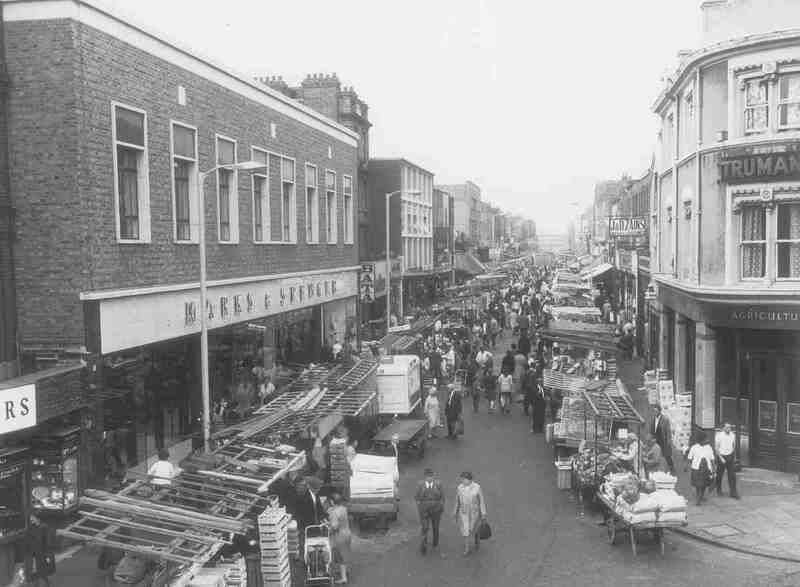 The conflict at Chapel Market had lasted over 5 years before it entered its final phase in 1981. The defining moment came one Sunday in July 1981 when, after several weeks of clashes, the usual NF turnout was supplemented by a 50 strong mob brought up from Brick Lane (the other big NF paper sale). The fascists managed to get into the area without being spotted and launched an attack. The anti-fascists, taken by surprise, were quickly overrun and forced to leave a bit sharpish - suffering two quite bad injuries in the process, one lad getting stabbed. If the NF had given chase the outcome would have been even worse, but anyway, the damage was done and it was obviously time for a serious rethink. "We heard reports that Brent NF had started a paper sale in Kingsbury (north-west London) on Saturday mornings so we decided to have a look with a view to attacking them in reply for the attack at Chapel. Plenty of familiar faces showed up at the Kingsbury sale so we organised a team to travel up there the next week. The point was made, five of them ended up in hospital!" There were several more smaller clashes over the next few weeks as the NF tried to re-establish their paper sale and the anti-fascists maintained their opposition. While Chapel Market was the focal point for activity, there were other incidents in the surrounding area. In October a small group of fascists were spotted at a local anti-fascist benefit gig and ran off when confronted. Outside one of the anti-fascists tripped and was stabbed in the chest as he was getting up. The blade narrowly missed his heart and he only survived due to the presence of a nurse with the anti-fascists. A prominent local anti-fascist organiser had her house attacked and her son, not involved in politics, was beaten up in the street. This only confirmed that there were some `unpleasant' elements in the NF who, unless they were confronted physically, would control the streets and therefore dominate politically. The next major incident was in November 1981 when an anti-racist conference was held at Archway, not far from Chapel Market. Anticipating a fascist attack the anti-fascists kept a low profile inside the hall, and sure enough, right on cue (i.e. Sunday afternoon closing time) 30 fascists were escorted up the road by the police. Led by prominent Islington NF members they confidently marched up to the door, unaware of the anti-fascist presence inside. The door flew open, and as the NF let off smoke bombs a large group of determined anti-fascists appeared through the 'mist' and caused considerable damage to the fascists. For the rest of the winter and into 1982 the anti-fascists mobilised every Sunday morning. The victory at the Archway had given the anti-fascists the advantage and the regular, well stewarded attendance every week showed the fascists there was a new level of commitment and organisation which they couldn't match. "The fascists took a heavy beating, and Anderson, who was on the ground being beaten with lumps of concrete and a shoe, managed to break free and ran out into the busy street. At this point three 'likely lads' got off a bus over the road and were studying the commotion with a keen interest. While we immediately recognised three late-comers who would be severely chastised later for oversleeping, Anderson could only see three 'white youths' who would surely come to his aid. Running through the traffic and waving his arms wildly he approached the 'aryan warriors' only to discover his mistake too late - suffering his second bad beating of the morning." After this clash word got back that the NF were recruiting a 'hit squad' to deal with this group of anti-fascists who had inflicted so much damage on them. Eddy Morrison, a well known (drunken) fascist from Leeds who was 'notorious' for glassing a student in a pub, was the person in charge of the 'contract'. Nothing ever came of this, but it does illustrate the effect the confrontational strategy was having on the fascists. Morrison did get to meet anti-fascists in London a year or so afterwards when his National Action Party tried to hold a meeting in Kensington - and yes, they got battered! The clashes at Kingsbury, Archway and Chapel Market broke the back of the NF paper sale in Islington. The fascists were unable to maintain their presence and by the end of 1982 the sale had collapsed. The last time the fascists were seen in the area was shortly after the 'Anderson affair' when a surveillance team spotted Paul Nash (another NF organiser - and victim of Kingsbury) looking round a corner with a pair of binoculars to see if there were any anti-fascists in the area! It had taken just over a year but the wheel had turned full circle and the NF were beaten. To make things worse, eight members of Camden & Islington NF were sent down for armed robberies at this time and the branch collapsed. This victory didn't just have a local impact, the collapse of the branch had a domino effect across north London with the NF ceasing to have any organised presence in what had been a strong area for them. However the story doesn't end here, because in 1983 nazi skinheads started drinking in a pub called The Agricultural on the corner of Chapel Market. The landlord was a fascist sympathiser and soon fascist skins from all over the country, and even overseas, would gather here on Saturday nights. By coincidence Red Action, the main group involved in the battle for Chapel Market, drank in a pub two hundred yards down the road. A low key campaign of harassment was launched against the pub, but escalation was inevitable. The fascists regularly attacked people in nearby streets - black people, gays, and anyone else they didn't like the look of; but never anti-fascists. Then, finally, a Red Action member was attacked outside the pub. The following week a pub on route from the tube station to The Agricultural was taken over and steps taken to try and draw the fascists out into the open. Fascists were attacked on their way to 'The Aggy' in full view of their 'comrades' outside the pub, in the hope that this would entice them out from the comparative safety of the pub. The fascists wouldn't have it, so the anti-fascists marched up to their pub where they were met with a rousing chorus of an old nazi hymn - which ended abruptly under a hail of bricks and bottles. The fascists scuttled inside and barricaded the doors (inevitably leaving some poor unfortunates outside!) while the anti-fascists withdrew and waited up the road. As more fascists arrived they ventured out and a large scale battle ensued on Liverpool Road for fifteen minutes. You don't get a hundred people brawling in the street for quarter of an hour without police intervention - they had obviously decided to let it happen. A few weeks after this, in June 1984, a large group of fascists attacked a GLC 'Jobs for a Change' festival in Jubilee Gardens. Both stages were attacked before anti-fascists got organised and drove them off. Shortly afterwards fascists waiting for medical attention in nearby St. Thomas' Hospital were attacked, and a large group of anti-fascists then travelled to Islington, anticipating that other fascists would regroup at The Agricultural. They did come, and they were attacked, including a German fascist, who having just been attacked in the street by an Irish anti-fascist, ran into the 'The Aggy' shouting "Get them, they're not English!". Again the pub suffered further damage. A more intense campaign of pressure on the establishment was then instigated, and within a few months the landlord gave up and shut the pub. Finally, Chapel Market had seen the back of the fascists.